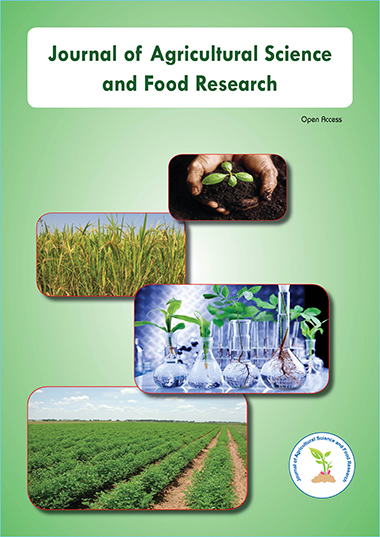 An experiment was conducted to study the effect of fermentation conditions on the properties of bio fertilizer from cow manure. The results indicated that the lowest value of bulk density was 946.63 kg/m3 at temperature of 50°C, 300 rpm agitation speed and 5 liter/min, ventilation rate while the highest value (983.17 kg/m3) obtained at temperature 30°C, 500 rpm agitation speed and 1 liter/min ventilation rate. The lowest moisture content was 79.87% at temperature of 30°C, agitation speed of 200 rpm and ventilation rate of 1 liter/min while the highest value was 83.19% at temperature of 50°C, agitation of 500 rpm and ventilation rate of 5 liter/min. The electrical conductivity increased from 11.6 ds m-1 at the start of fermentation to 35.07 dS m-1 at the end of fermentation period depending on the treatments under study. The pH decreased from 8.13 at the start of fermentation to 6.77 at the end of fermentation period. The total solid of the biofert decreased from 21.2% at the start of fermentation to 16.81% at the end of fermentation period, where the lowest value was 16.81% at temperature of 50°C, agitation speed of 500 rpm and ventilation rate of 5 liter/min and the highest value (20.13%) recorded at temperature of 30°C, agitation speed of 200rpm and ventilation rate of 1 liter/min. The lowest TN% was 0.41% at 50°C fermentation temperature, agitation speed of 500 rpm and ventilation rate of 1 liter/min while, the highest value (1.18%) obtained at temperature of 35°C, agitation speed of 300rpm and ventilation rate of 5 liter/min. The O.M% decreased from 34.2% at the start of fermentation to 10.97% at the end of fermentation period. Regarding the microbial changes, all treatments showed disappearance of pathogenic microorganisms at temperature of 50°C, at all agitation speeds and ventilation rates.